A total of 149 custom panels cover nearly 11,000 sq. 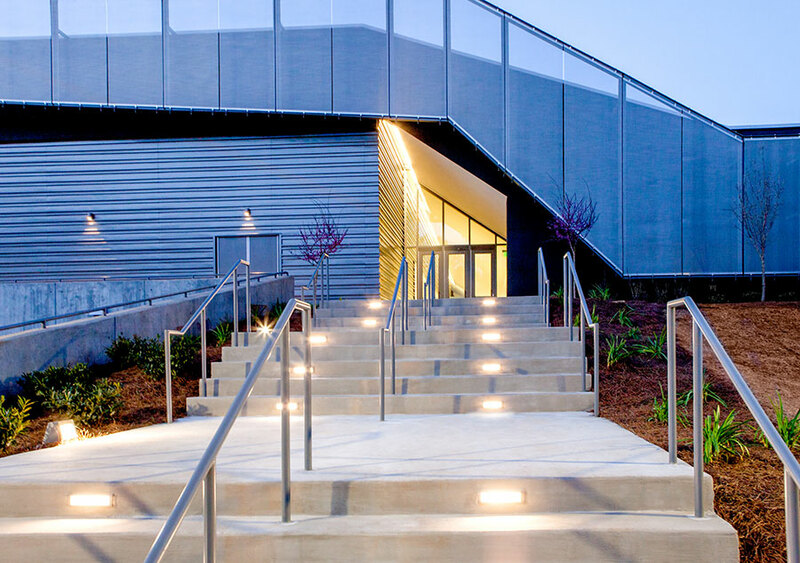 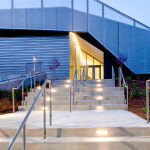 ft. of the facade, providing a passive approach to daylighting, glare reduction, shading, and solar heat gain reduction. 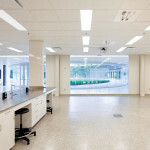 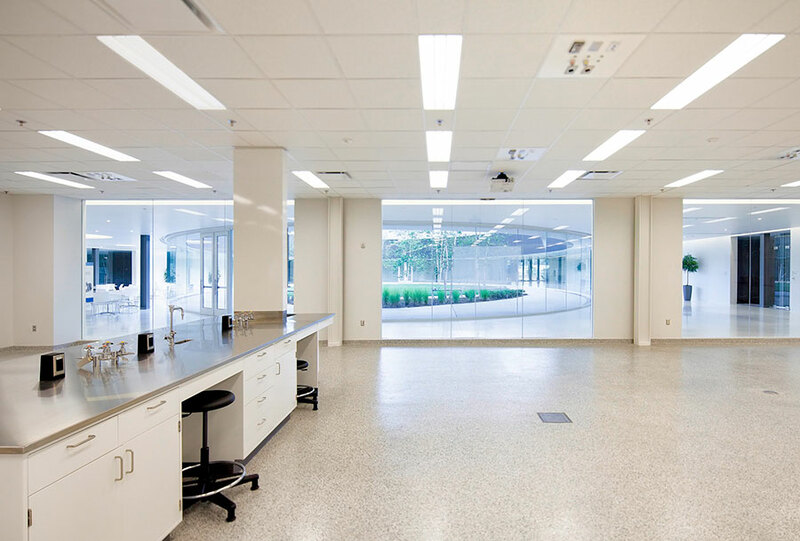 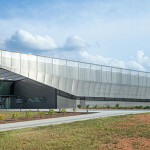 The Georgia BioScience Training Center is a signature building with a dual purpose: a high-tech facility supporting research critical to bio-manufacturing that brings identity to Georgia’s growing biosciences industry. 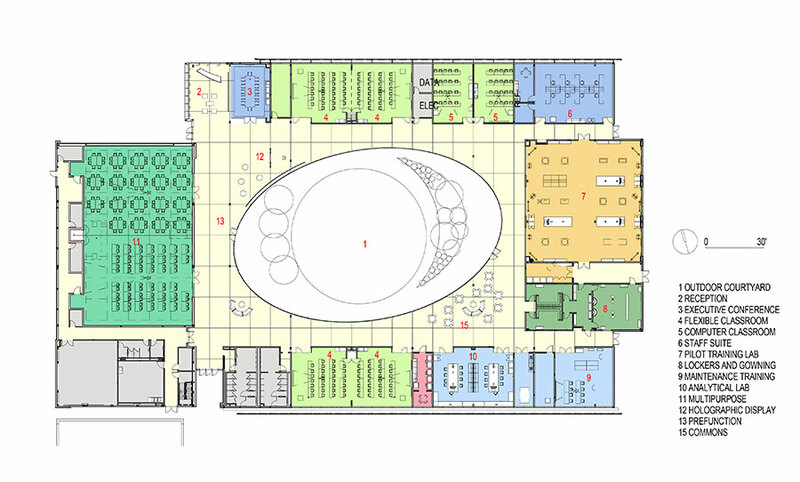 The 40,305 sq. 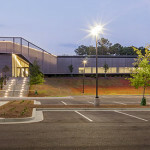 ft. building is sited approximately 45 miles due east of Atlanta in Social Circle, “Georgia’s Greatest Little Town,” and houses laboratories, classrooms, meeting rooms, and large gathering spaces. 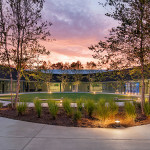 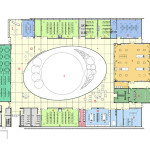 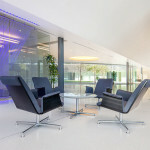 The building is organized around a large elliptical courtyard lined with glass walls. 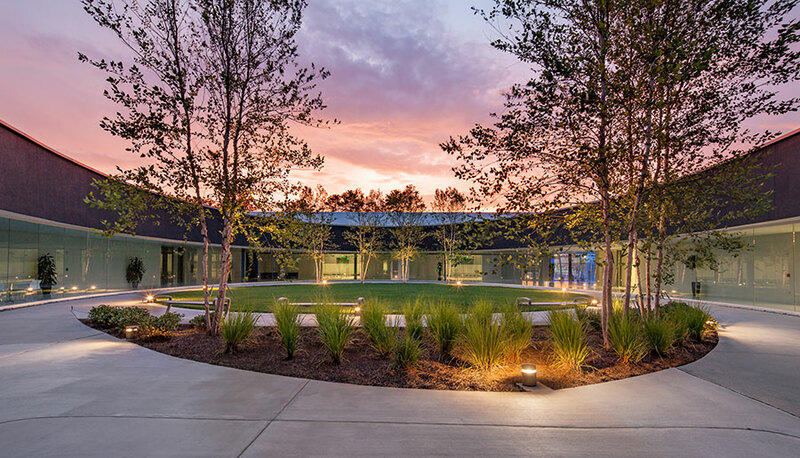 “Building planning centered on the idea of a “10 minute marketing tour” as the state will tour thousands of future ‘prospect’ companies through the facility,” says Nathan Williamson, Associate Principal at Cooper Carry. 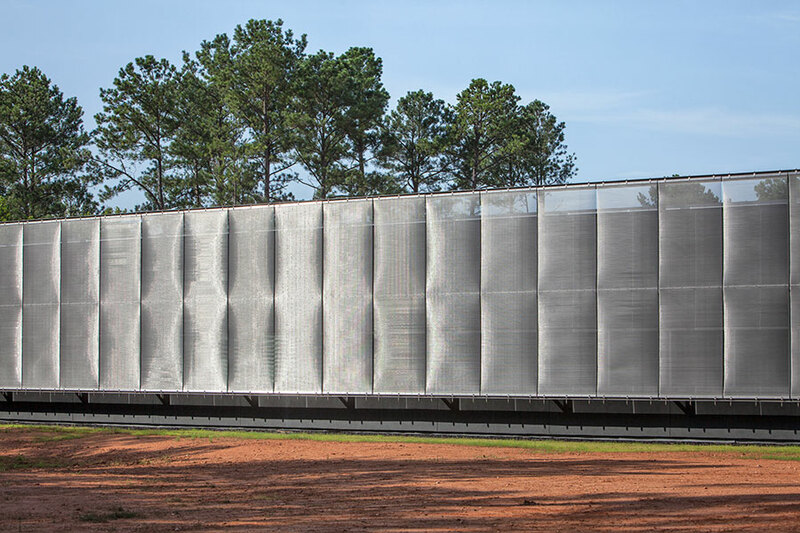 The most striking feature of the building envelope is a large angular metal mesh veil, suspended off the building by a steel frame. 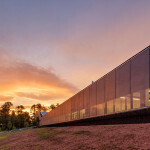 Williamson notes the versatility of the aesthetic properties of the material combined with the performance of the veil as a passive solar shading device brought a significant value to the project: “We infused stainless steel into the exterior design to capture the performance benefits of shading while expressing the connections of the system which enhance the client’s brand of a decidedly hi-tech facility. 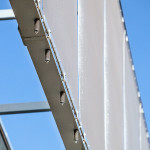 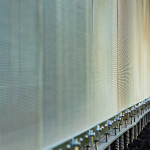 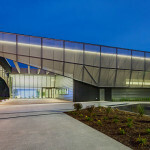 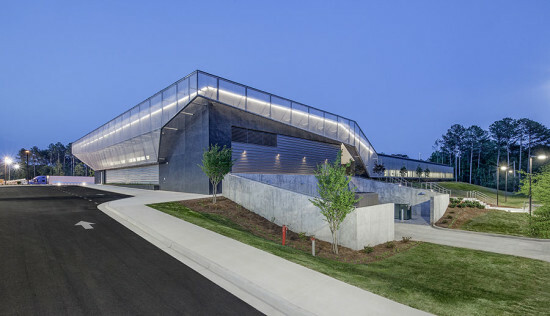 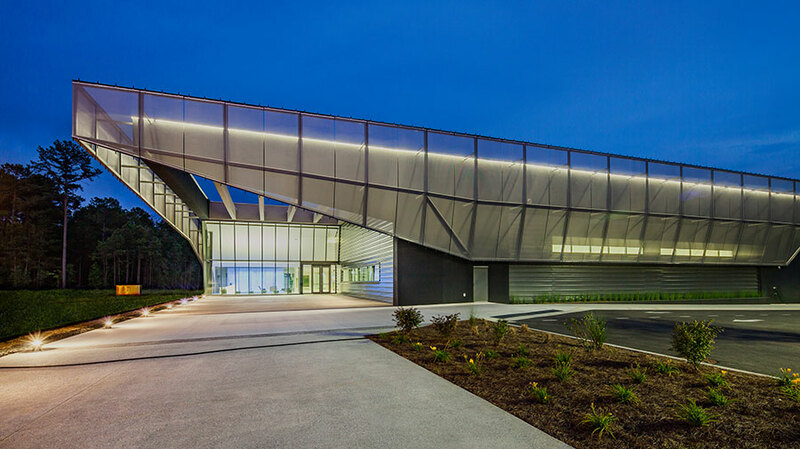 The mesh is expressed independently from the orthogonal main façade with facets and plane changes to provide a dynamic, crystalline aesthetic with ever changing shadows and reflections that suggest a sense of movement.” The BioScience Center’s high precision metal facade assembly is a familiar aesthetic for the high-tech students and visitors of the facility. 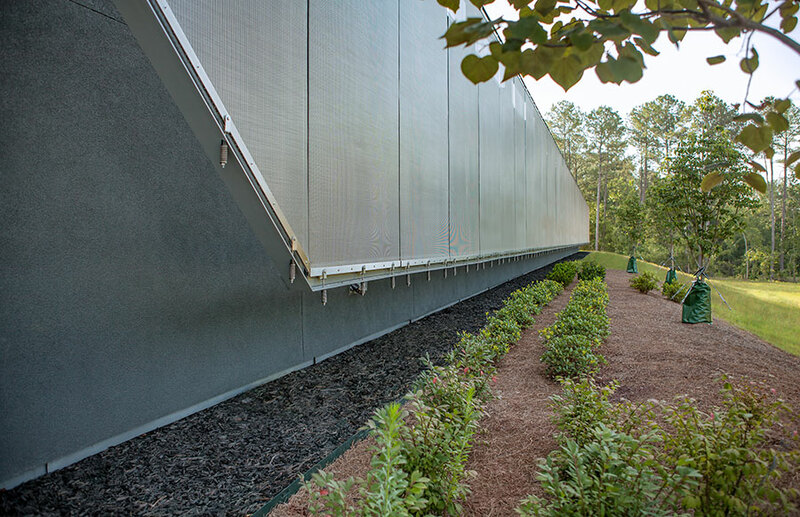 The rigid panels are fabricated as trapezoidal shapes to account for the faceted panels. 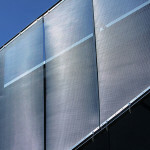 When folded into place, the panels assume an orthogonal ribbon-like patterning. 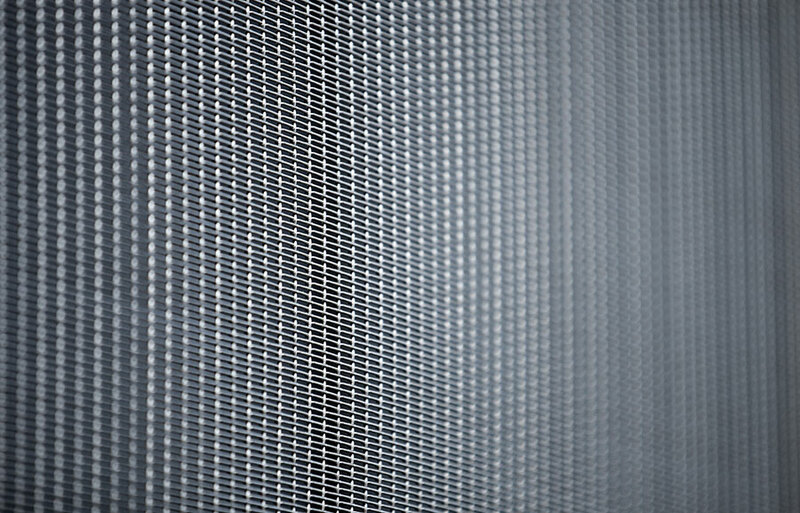 Cambridge developed the rigid mesh to allow for a one-directional bend. 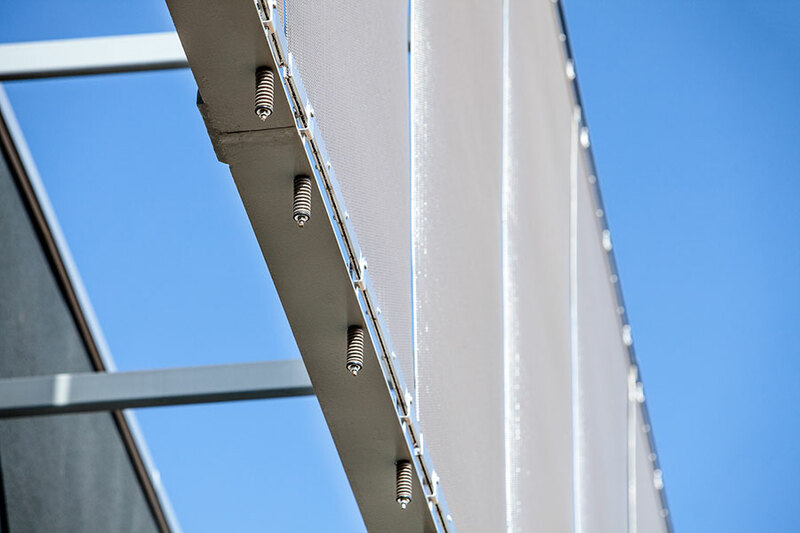 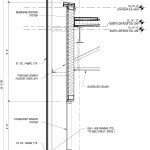 The product is suspended in tension off a rigid steel frame that allows the dimensions of the panel to be maximized with fewer intermediate supports. 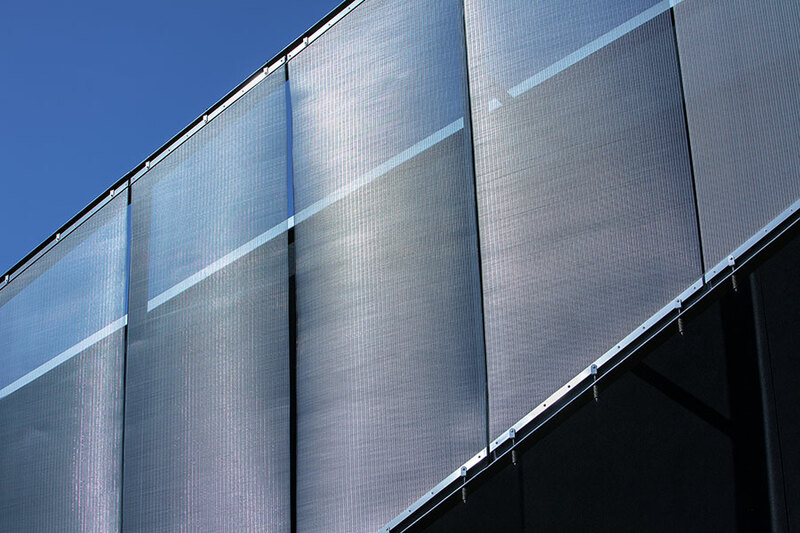 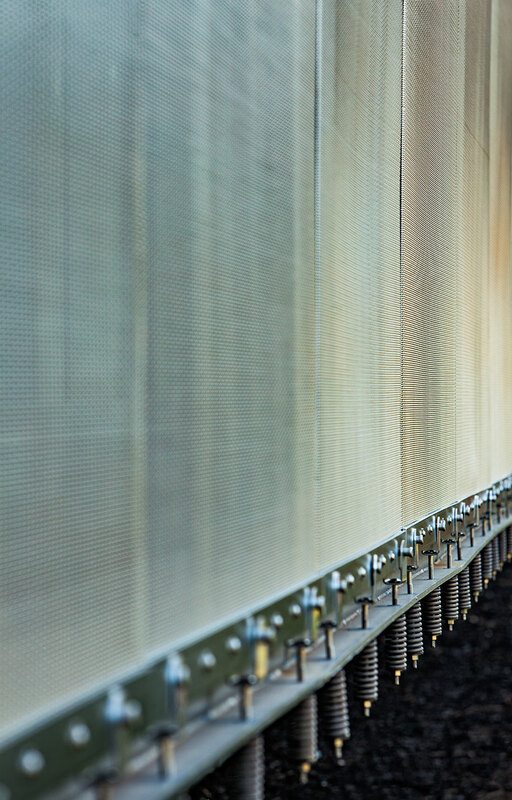 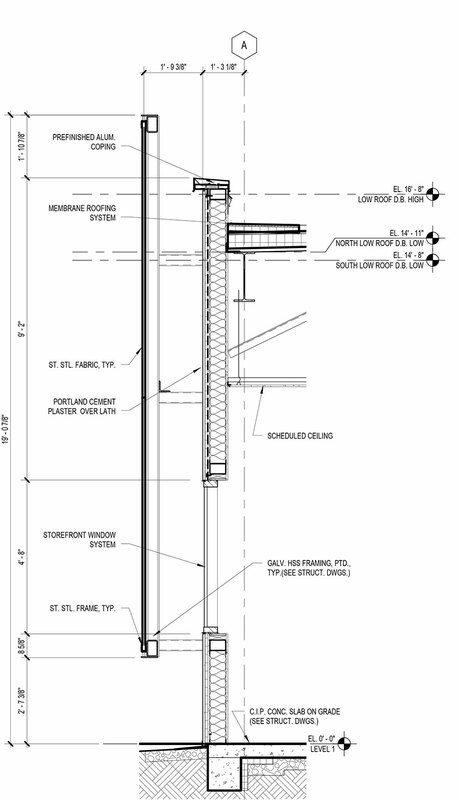 The result is a lightweight (1.28psf) panel with a maximum width of 10 feet, and a maximum length of 100 feet. 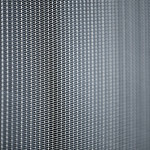 A unique feature of Lanier is the ability to expand and contract the open area of the mesh, by removing fill wires as the pattern repeats. 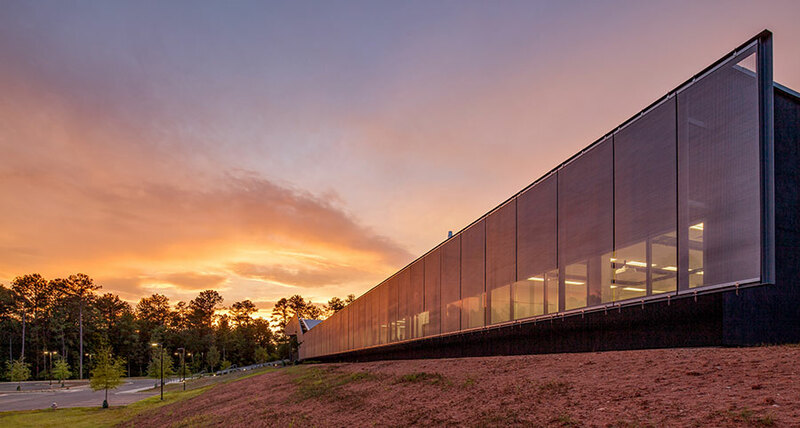 What results is a quality of lightness in the material – the ability to block direct sunlight while maintaining views from within the building. 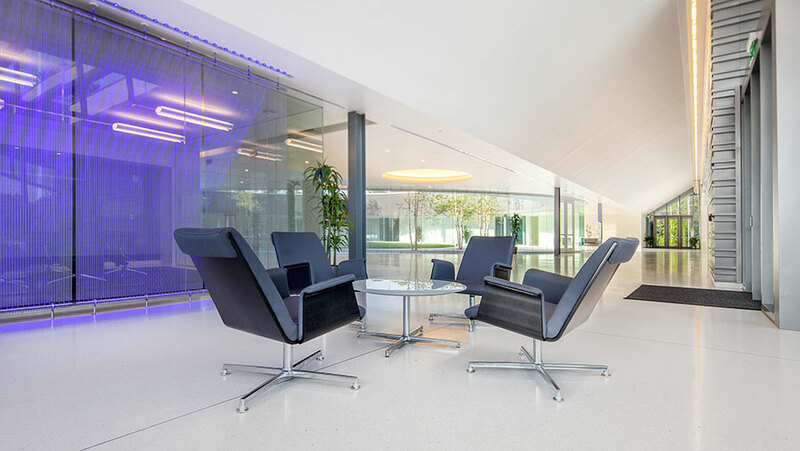 “We know that architects are seeking flexibility and looking for mesh choices that create a more stimulating visual appearance while providing options for varying degrees of light passage,” said Cambridge National Sales Manager David Zeitlin. 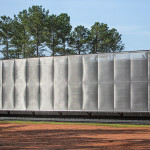 “In the case of Lanier, they can even choose to expand the openness of the pattern for a single panel. 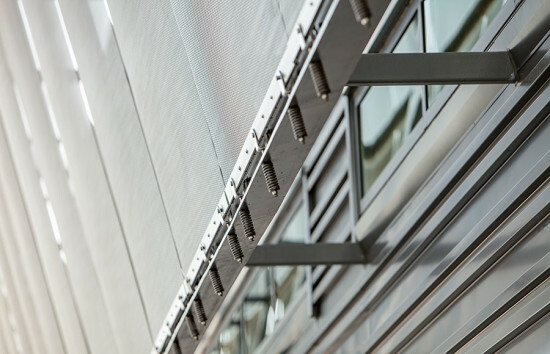 We call this option Transition.” The material has been used for exterior facades, solar shading, parking garages, and interior screen walls.